This intermediate example demonstrates, how to create a rather nice interface element being an arrow that points between a on-screen object (normally player) and a off-screen location, that needs to be reached. 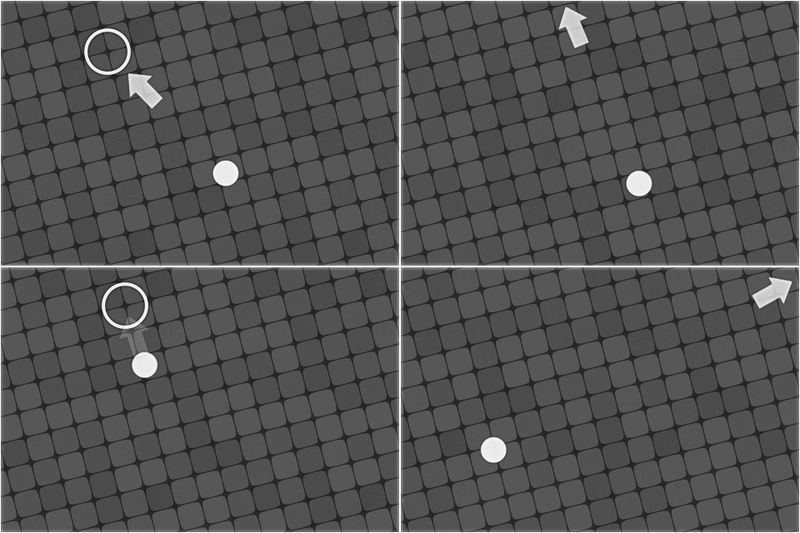 In this case, arrow indicates exact direction to target, and is made to clamp accurately to screen edges (preserving direction vector), to avoid confusion on behalf of player. Such feature is specifically useful for exploration games, where goal(s) may be at different distance from player, and some guidance is required. Where src is source object (usually, player); dst is destination object (exit, etc. ), pad is distance between the pointing object and view borders, and inner is the distance to goal under which the pointing object should start to fade out. It to be put into Step\End Step event. You can’t retrieve tile’ coordinates like that, but if you place the tile by your own code, you could store the position in a pair of global variables and use them instead. Hey can you update the download link? It’s broken, thanks! Updated and added the code to the post itself. Great help, just what I was looking for. Thanks !